Adriana represented Kingston at the Ontario Provincial Fair in Toronto, June 7 and 8 and sang O Canada at the Opening Ceremonies attended by the Lieutenant-Governor, the Honourable David C. Onley. Voltigeurs, and the Mohawks battled together to solidly defeat and win victory over the American force saving Montreal from being conquered. 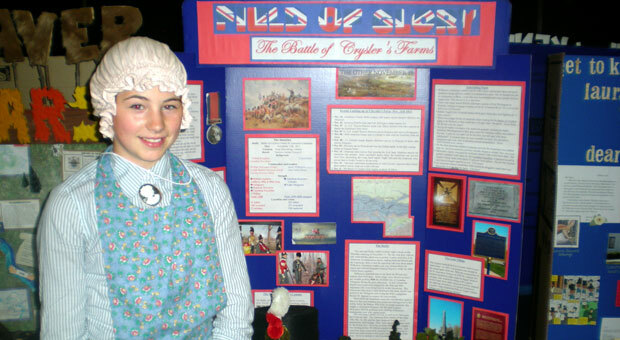 What was the impact of the Battle of Crysler’s Farm on Canadian History? The Battle of Crysler’s Farm was significant because The British and Canadians, although greatly outnumbered, managed to keep the American troops from taking over Eastern Ontario and moving on to capture Montreal. What is your topic important to Canadians today? Today we are friends with the United States but that was not always the case. In 1812 – 1814, we were enemies and at war. If Great Britain and the people of Canada had of lost that war, we would probably be Americans today instead of Canadians.